The green beret was originally designated in 1953 by Special Forces Major Herbert Brucker, a veteran of the OSS. Later that year, 1st Lieutenant Roger Pezelle adopted it as the unofficial headgear for his A-team, Operational Detachment FA-32. They wore it whenever they went to the field for prolonged exercises. Soon it spread throughout all of Special Forces, although the Army refused to authorize its official use. Finally, in 1961, President Kennedy planned to visit Fort Bragg. He sent word to the Special Warfare Center commander, Brigadier General William P. Yarborough, for all Special Forces soldiers to wear their berets for the event. President Kennedy felt that since they had a special mission, Special Forces should have something to set them apart from the rest. Even before the presidential request, however, the Department of Army had acquiesced and teletyped a message to the Center authorizing the beret as a part of the Special Forces uniform. When President Kennedy came to Fort Bragg October 12, 1961, General Yarborough wore his green beret to greet the commander-in-chief. The president remarked, "Those are nice. How do you like the green beret?" General Yarborough replied: "They're fine, sir. We've wanted them a long time." A message from President Kennedy to General Yarborough later that day stated, "My congratulations to you personally for your part in the presentation today ... The challenge of this old but new form of operations is a real one and I know that you and the members of your command will carry on for us and the free world in a manner which is both worthy and inspiring. I am sure that the green beret will be a mark of distinction in the trying times ahead." In an April 11, 1962, White House memorandum for the United States Army, President Kennedy showed his continued support for the Special Forces, calling the green beret "a symbol of excellence, a badge of courage, a mark of distinction in the fight for freedom." To honor his memory, Special Forces soldiers pay their respects to late President Kennedy by laying a wreath and green beret on his tomb every November twenty-second, the date of his assassination. 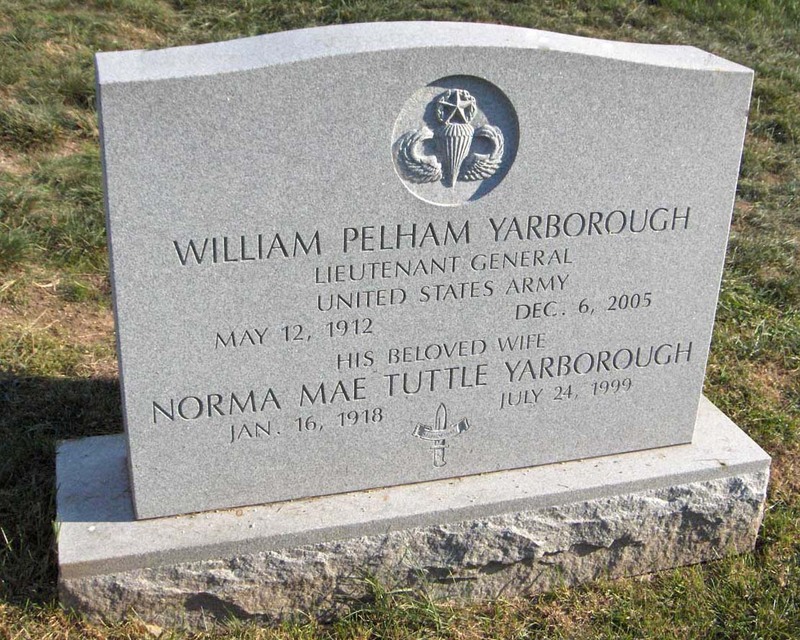 Lieutenant-General William Pelham Yarborough (born May 12, 1912 in Seattle, Washington) and died December 6, 2005, was a U.S. Army officer and a 1936 graduate of West Point. He is descended from the York County House of Yarborough which can trace its lines to the Battle of Hastings in 1066 under the founder of the house: Eustacius de Yerburgh. William Yarborough is a distant cousin to such British noble figures as the Baron Deramore and Lord Alvingham. In 1941, Yarborough was a Captain when the Army began to experiment with Airborne forces. At that time, he designed the parachutist badge, also known as "jump wings", proudly worn by airborne troops after 5 combat jumps. During World War II, Yarborough planned the first combat airborne assault, Operation Torch, and also jumped in it with the 509th Parachute Infantry Battalion. He later became commander of this unit during the Italian Campaign. Yarborough was later known as the "Father of the Green Berets", as first commander of the Special Warfare Center, and a pioneer in special forces tactics. From 1 December 1966 to 15 July 1968, Yarborough, then a Major General, served as the Assistant Chief of Staff for Intelligence, Headquarters, Department of the Army. He was later promoted to Lieutenant General. General Yarborough is a member of the Military Intelligence Hall of Fame. After 35 years of dedicated service to the United States, General retired from the US Army in 1971. SOUTHERN PINES, NORTH CAROLINA - Retired Lieuenant General William P. Yarborough, an early leader of the Army's Airborne forces who gained President John F. Kennedy's blessing for special forces soldiers to wear green berets, has died, a family spokesman said Wednesday. Yarborough, 93, died late Tuesday after complications from recent hip surgery, said Rudi Gresham, the General's longtime aide. Yarborough gave little outward sign of his true character as a rugged, silent professional, said friend Ed Matney of Southern Pines. "He was very modest, very intellectual," said Matney, a retired Airborne colonel and fellow West Point graduate. Bruce Warlick, Yarborough's neighbor and friend, said the career officer carried over his orderly habits after he moved next door. "Things had to follow the table of organization. That included the upkeep of his home. He always had people working at his house. I joked that I would blow the leaves into his yard because he had people come to clean them up," Warlick said. Yarborough was born on May 12, 1912, in Seattle, Washington, graduated from West Point in 1936. served in the military for 35 years and held high-level posts in the Army's airborne, special operations and intelligence branches. He was made commander of the Army's Special Warfare Center, now the John F. Kennedy Special Warfare Center and School at Fort Bragg, in 1961 as the Vietnam War was increasing the demand for stealthy combat skills. He retired in 1971. In 1941, he designed the paratrooper's boot and uniform and the winged insignia given to qualified paratroopers, according to Yarborough's official Army biography. Yarborough led paratroopers into battle in North Africa, Salerno and Anzio in Italy, and southern France during World War II. "He told me he made it through the war and never needed a Band-Aid though he lost troops all around him," Warlick said. After the war, Yarborough was placed in charge of police activities in Vienna, Austria, where he organized patrols of American, Soviet, French and British troops. As head of the special warfare center in 1962, Yarborough tapped an old West Point classmate who was a military aide to Kennedy to press his case to allow the green beret to become part of the uniform of Army special forces soldiers. Kennedy was visiting Fort Bragg to see a demonstration of special forces units and said he wanted to see the troops in the berets. Yarborough's military service also is commemorated with a knife named after him and issued only to current or former Green Berets. Each Yarborough knife bears a serial number registering its owner. A life-sized bronze bust by sculptor Zenos Frudakis, who produced the statue of golfer Payne Stewart for the nearby Pinehurst golf resort, was unveiled in September at the Airborne & Special Operations Museum in Fayetteville, which borders Fort Bragg. Warlick, Matney and two others raised $8,000 in donations to pay for the Frudikis bust. The task was made easier because former Green Berets deeply admired their former general, Warlick said. "So many of his ex-special forces people wanted to come and sit at his feet," Warlick said. Yarborough is survived by his daughter, Patty Reed, and his son, retired Special Forces Lieutenant Colonel Lee Yarborough. William P. Yarborough, 93, a retired Army Lieutenant General who was an early Special Forces commander and also helped oversee a surveillance operation on thousands of Americans during the late 1960s, died December 6, 2006, at a hospital near his home in Southern Pines, North Carolina. He had complications from a broken hip. General Yarborough, the son of an Army Colonel and intelligence officer, had a major role in forming Army airborne operations at the start of World War II. He also was involved in some of the most daring and brutal operations of the war, including the invasion of Sicily, in which he saw his men mistakenly raked by Allied gunnery. Army Lieutenant General William P. Yarborough with President John F. Kennedy in the early 1960s. Yarborough was an early leader of the Special Forces. In 1961, after commanding a military intelligence group in Stuttgart, Germany, he began a four-year tenure as leader of both the Army Special Warfare Center and Special Warfare School at Fort Bragg, North Carolina. 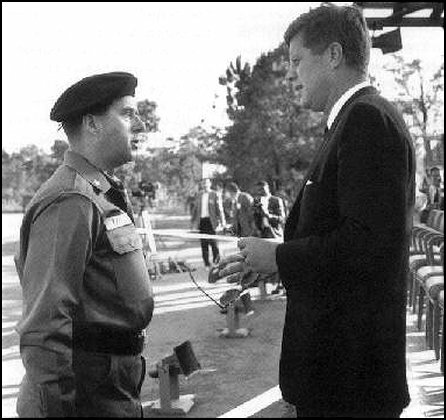 He was credited with persuading President John F. Kennedy, during a visit to the center, to introduce the green beret as a visible way to distinguish the Special Forces. The Green Berets were specialists in unconventional and anti-guerrilla warfare, trained to promote resistance behind Cold War lines. General Yarborough, known as the "Big Y," also helped add counterinsurgency training because of the increasing likelihood that special forces could help in the heightened conflict in Vietnam. During the 1967 race riots in Detroit and Newark, local law enforcement agencies were found to be ill equipped to handle the disorder. A report in the New York Times said that "troops called in to help restore order had little more than Esso road maps to guide them in both cities." A federal operation named Continental United States Intelligence, or Conus Intel, was set up to aid local authorities. General Yarborough figured prominently in the operation during his 18 months as the Army's top intelligence planner. As assistant chief of staff for intelligence, he helped the effort to monitor members of groups deemed subversive -- radicals, antiwar protesters and black militants. A subsequent investigation by federal officials revealed that the Army had inserted thousands of civilian names into a computer system, including those it had monitored at antiwar rallies, and categorized them by their potential for causing trouble. The list came to include members of the John Birch Society, the NAACP, the Ku Klux Klan and the Daughters of the American Revolution. "We had some reason to feel outside influences were aiding and abetting those who had a legitimate right [to protest] inside the U.S., and this became the reason to try and invoke more sophisticated means to find out who was doing what," General Yarborough told a reporter in 1993. He later wrote, "The overwhelming bulk of information the U.S. Army gathered in connection with the civil disorders during the 1960s came from the American press and direct observation, not 'spying.' "
William Pelham Yarborough was born in Seattle, Washington, on May 12, 1912. He was a 1936 graduate of the U.S. Military Academy, where classmates included two future commanders of U.S. forces in Vietnam, Army Generals. William C. Westmoreland and Creighton W. Abrams Jr. In one of his earliest assignments, at Fort Benning, Georgia, he was a test officer for a provisional parachute group and had a lead role in designing the paratrooper's boot, uniform and qualification badge. General Mark Clark selected him in July 1942 as his adviser in England to help plan the airborne phase of the invasion of North Africa. He also helped lead paratroop task forces in North Africa. The invasion of Sicily in 1943 provided General Yarborough, then a battalion commander, with one of his grimmest memories: the downing of 23 troop transport planes and 410 men by Allied antiaircraft fire. The poor coordination among air, ground and naval forces led the Allies to mistake the U.S. transport planes for German bombers that had shortly before flown over the area. After seeing wounded paratroopers leaping from crippled aircraft, General Yarborough said: "They all jumped. Every man in my plane jumped although some could hardly stand up. I haven't found them all yet, but every man jumped." He later liberated a series of villages in Sicily and while commanding the 509th Parachute Battalion became part of the force that landed at Anzio-Nettuno and participated in the invasion of Southern France. As provost marshal for U.S. Forces in Austria after the war, he helped shuttle the Russian-born dance legend Vaslav Nijinsky and his wife from Vienna to England, where the dancer, in the throes of advanced mental illness, spent his final years. In 1965, General Yarborough proved an unbendable negotiator with the North Koreans over matters related to the Korean War armistice. Meeting in Panmunjom, a village on the border between North and South Korea, the talks erupted into volleys of sarcasm, with a North Korean major general telling General Yarborough to quit "playing the role of an announcer of the Voice of America." General Yarborough replied with a reference to a play then being staged in Beijing called "A Bucket of Manure." His final active-duty assignment, in 1971, was chief of staff and deputy commander in chief of the U.S. Army in the Pacific. He later wrote military and political books and was a State Department consultant in Africa. His decorations included two awards of the Distinguished Service Medal, the Silver Star and four awards of the Legion of Merit. Soldiers who graduate from the Special Forces Qualification Course receive a combat knife named in his honor. Gen. Yarborough married Norma Tuttle, the daughter of an Army Colonel. She was crowned Miss Topeka of 1936, and her bridal portrait was used in a Camay soap advertisement. She died in 1999. A daughter, Norma Kay Yarborough, died in 1961. Survivors include two children, retired Army Lieutenant Colonel. William Lee Yarborough, a Special Forces and Army Ranger veteran, of Falls Church, and Patricia Reed of Atlanta; four grandchildren; and a great-grandson. Saturday afternoon, a Special Forces soldier reverently carried a brass 105 mm howitzer shell casing containing the ashes of Lieutnant General William P. Yarborough into Emmanuel Episcopal Church in Southern Pines. In the distance, the plaintive wail of a bagpipe carried through the clear cold air, sounding at once martial and mournful. Neighbors, friends, family and comrades in arms passed into the sanctuary through an honor guard, rifles at rest. They came to remember and offer thanksgiving for the life of an old soldier. Yarborough died December 6, 2005, in FirstHealth Moore Memorial Hospital of complications from a broken hip. he was 93. Son of an Army colonel and intelligence officer, Yarborough had a stellar military career. He played a crucial role in developing Army airborne capability and operations from the very beginning of World War II. From his daring jump into North Africa through much fierce fighting in the European theater of operations, Yarborough parachuted again and again. His silver Airborne Wings — the parachute qualification badge he designed, along with jump boots and jump uniform — eventually would bear four stars for four jumps into combat. A 1936 graduate of West Point, Yarborough would meld experiences from his first assignment with indigenous forces in the Philippines with fighting experience as the first commander of Fort Bragg’s training school on special operations, now the John F. Kennedy Special Warfare Center and School. “It is now,” Kennedy said. The 82nd Airborne Chorus, performing a cappella, sang “Amazing Grace." “It’s damned embarrassing for an old paratrooper to have fallen and broken his hip,” he told her during one of their last visits. “I thank God for his life among us,” she said. Professionals in Washington wrote “a real nice speech, a wonderful speech” to be delivered by Yarborough’s old friend and aide for many years, Rudi Gresham. He didn’t use it. “The family told me, ‘tell about the real Bill, as you knew him’ so that is what I’m going to do,” he said. “I knew him as an artist who sent Christmas cards every year, a different one for each individual, with a different drawing of his on each one. Gresham called attention to the rarity of anybody earning a star for their Airborne wings by jumping into combat. “This man had four,” he said. There were remembrances from the family. His granddaughter, Heather Reed, read a poem describing Yarborough’s determination to be certain each new day, exchanged for a day of his life, was worth the price. His son, retired Lieutenant Colonel William Lee Yarborough, re-called arriving by train in Vienna, Austria, then under a four-power agreement with sectors controlled separately by British, Russian, French, and American Forces. “My dad used all of his powers of drama to make Americans thought of as the good guys,” he said. “He organized the famous ‘four men in a Jeep’ that had one soldier from each country to put a stop to trouble wherever it started. “I remember him as a man of high drama, ethical, patriotic, artistic, funny and a risk taker. He understood ‘elite’ as having a spiritual sense of righteousness and goodness. Special Forces were like a religion to him. He loved this town and wrote letters to the editor about his concerns. When that didn’t work, he drew cartoons." His father never lost himself in his suffering, he said. The son paid final tribute to his father in simple terms. “His life made a difference,” he said. Following the committal, the 82nd Airborne Chorus sang, this time from a balcony at the rear of the sanctuary. It was a familiar tune, one Yarborough himself had chosen years before, the “Ballad of the Green Beret,” echoing in song something of his contributions and his values. Afterward, the family invited everyone to join them at a reception at The Country Club of North Carolina. There will be a memorial service in the Special Forces Chapel at Fort. Bragg at 10 a.m. Tuesday. Burial with full military honors will take place on a future date in Arlington National Cemetery. NOTE: The General will be laid to rest with full military honors in Arlington National Cemetery on 21 April 2006. Encased in a sealed 105 mm artillery shell, the ashes of Lieutenant General William P. Yarborough were being laid to rest at Arlington National Cemetery following a memorial service in the chapel. Yarborough died December 6, 2005. He lived in Southern Pines after retiring from a military life that began at West Point. He was in the class of 1936. By 1941, Yarborough was a captain in an Army just beginning to test the idea of Airborne forces. He designed the parachutist badge, the famous “jump wings” as well as the first jump uniform and jump boots. In World War II, General Mark Clark picked Yarborough to plan the first combat airborne assault, Operation Torch. He jumped in it with the 509th Parachute Infantry Battalion, and later commanded that unit in an ill-fated invasion of Sicily. He watched as wounded men jumped from doomed aircraft. His 509th went on to liberate Sicilian villages and invade the south of France. Later, coordinating four-power forces in Vienna, Yarborough came up with a solution to avoid conflicts between forces of France, England, Russia and the United States: He put one military police officer from each country in a single “four-power” jeep. In 1965, he served as a negotiator with North Korea at the Panmunjom talks leading to the Korean War armistice. Yarborough became known as the “father of the Green Berets” after winning direct presidential approval of the headgear during an April 1963 visit to Fort Bragg by President John F. Kennedy. He became the first commander of the Army’s new Special Warfare Center, later named for Kennedy, and pioneered special operations tactics. Yarborough served two years as Assistant Chief of Staff for Intelligence. His last Army assignment, in 1971, was as chief of staff and deputy commander in chief of the U.S. Army in the Pacific. Yarborough’s decorations include the Distinguished Service Medal, the Silver Star, four awards of the Legion of Merit. His jump wings bore four gold stars for jumps into combat. Soldiers who qualify for Special Forces now receive a combat knife named in his honor along with their tabs and green beret. Each Yarborough Knife has a serial number registered to its owner. Knife No. 1 went to Yarborough, personally delivered to him in Southern Pines. 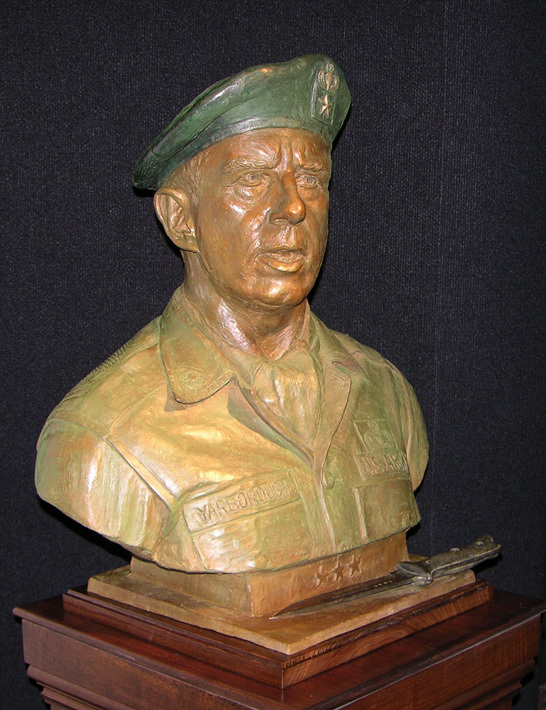 A bust of him, with the knife and beret, is in the Special Operations Museum. The shell casing was his idea. He told his son, retired Army Lieuteannt Colonel William Lee Yarborough, a Special Forces and Army Ranger veteran, he wanted to be cremated and his ashes buried in a 105-mm. Howitzer shell. That brass shell was used at services for him last December in Emmanuel Episcopal Church and also at the Special Forces Chapel on Fort Bragg. It was later brought to a jeweler in Southern Pines along with a sealed bag containing his cremated remains. Jerry Whipple and his wife, Lisa (who runs Gemma Gallery in Pinehurst), have had some unusual requests, but this was unprecedented. Whipple first cut the shell casing down to the requisite length, then engraved the shell according to the general’s wishes. Yarborough’s wife, Norma, died in 1999 and was buried at Arlington. She was Norma Tuttle, Miss Topeka 1936, and daughter of an Army colonel who had served under George Marshall in China. After engraving the casing as directed, Whipple blocked the base, then reverently worked the sealed bag containing the remains inside. He put the brass disk on top, and used a special laser device to seal the end with an invisible weld. “I added gold to be sure I had a seamless closure,” Whipple said. Lee Yarborough collected the canister from Powell Funeral Home to carry it to services in the chapel at Fort Myer — just next to the national cemetery. A funeral cortege leaving the chapel would have a troop unit with a band, a caisson (gun carriage) bearing the canister, a back rider-less horse with boots backward in the stirrups. His father had been a man of vision, whose understanding of the changing nature of war was often ahead of his time, foreseeing threats (like al-Qaida) only unconventional warfare could meet. Yarborough’s farsightedness is recognized at last, he said. Special operations started with direct presidential support during World War II, when Franklin Delano Roosevelt, a Democrat, picked a Republican — “Wild Bill” Donavan — to head the Office of Strategic Services, the OSS. The nation needs highly trained, mature soldiers with judgment as well as skill for wars of this kind, Yarborough said. Behind Yarborough’s legendary toughness, behind his direct manner, were deeply ethical core beliefs, his son said. Yarborough sought guidance from a general who would later be an educator, in command of The Citadel.